Dave Millington decided something had to change. After his wife Dana Millington spent 63 consecutive days in the hospital with their daughter, Madison Claire, Dave and Dana had a great deal of personal experience with children’s hospitals. And though the quality of care could be the best possible, the small, impersonal rooms left a lot to be desired. Especially for a space in which a mother and a chronically-ill child would spend so much of their time. Shortly after Madison passed away at age two, Millington re-focused his energies on helping other families facing a long-term hospital experience. He joined forces with another parent, Brian Schepperle, who also had lost a child to disease to create more family-friendly environments in the hospital setting. And what better place to start than with the hospital room – the place where children and their families spend the majority of their stay. Millington and Schepperle joined forces with the University of Minnesota Children’s Hospital, Fairview to launch the Adopt A Room initiative – creating the welcoming, less-stressful environments they themselves would have wanted. The Adopt A Room suites include large-screen TVs for watching movies, table space for playing games or doing homework, and control of a rooftop zoom camera for exploring the outdoors. 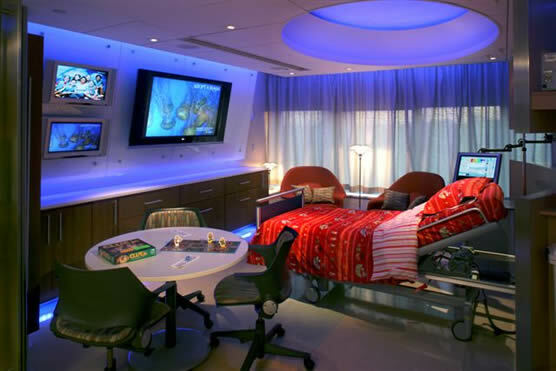 Children can control the lighting and color of their rooms from touch-screen computers at their bedsides. Millington and Schepperle initially raised money through small events and corporate donations to fund Adopt A Room. Today, the program sustains itself with an annual fundraiser hosted by the Minnesota Medical Foundation and sponsorships of the rooms. For more information on Millington’s Adopt A Room you can visit the University of Minnesota Amplatz Children’s Hospital Adopt A Room Webpage.